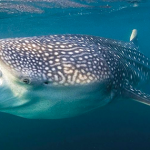 More than 20 whale sharks in one day sighted this week, just amazing! Past weeks nature give us an average of groups from 3 to 5 whale sharks in the area but weather conditions were rude some days. But this is the way it is every year, the main problem is the constant change of wheater conditions and some storms that hit the area two weeks ago. 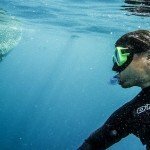 Cancun has become the top destination to swim with the whale sharks in America, from May to September huge concentrations of these giant sharks arrives at the Mexican Caribbean. There is only one season per year, and the best months of the season are between last week of June to August. 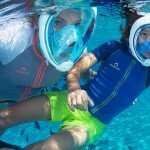 Swim with the whale sharks is 100% safe, guaranteed! These are in the list of harmless sharks in the world. If you are staying at Cancun or The Riviera Maya don’t miss this incredible experience. This is a half day tour, ideal to experience a unique and 100% nature and adventure tour during your vacations. 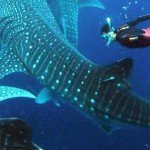 We recommend you to take the tour first weeks of June and for more probabilities to sighting more than 5 whale sharks, try to book in the months of July and August. The months of July and August, in general, are the warmest months of the year, our experience of past 6 years confirm that! 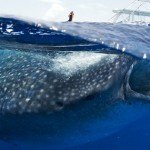 If you are not ready to book a whale shark tour from Cancun yet, please find more answers in our whale shark tour Cancun faq and take the best desition, don’t miss the opportunity like this past days where more than 20 whale sharks in one day sighted this week, a unique experience. Please don’t hesitate to contact us if you want to add this tour to your Mexico vacational plan, also, we provide the private whale shark tour option, for more comfort(private, land and boat transportation) for more chances to swim with the whale sharks.